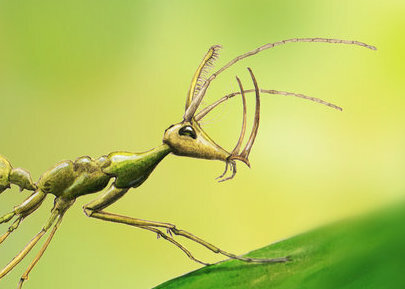 Recently, I ran across the artwork shown below, depicting an ant (Formicidae) by the name of Ceratomyrmex ellenbergi; according to the author, the creature is known in fossil form from mid-Cretaceous Burmese amber. Since I found the supposed reconstruction on a forum nominally devoted to speculative evolution, I naturally assumed the insect to be fictitious. Not biologically implausible, by any means: but that seta-covered projection on the head, nearly touched by vertical scythe-mandibles? Give me a break. Clearly, this was merely an admirable thought experiment, too outlandish to be genuine. Of course, much to my pleasure and chagrin, Ceratomyrmex is quite real (Perrichot et al., 2016): and no artistic license was taken. It is a member of the Haidomyrmecini, a basal tribe of the Formicidae known only from the mid-Cretaceous, and already characterized by unique cephalic equipment consisting of a setose median lobe (which could be interpreted as an extension the clypeus; Barden & Grimaldi, 2013) directly betwixt the antennae, scythe-shaped mandibles that—uniquely among ants—swing on a vertical axis, and a singularly elongated face to accommodate these mandibles. It appears that Ceratomyrmex represents an exaggeration of these haidomyrmecine traits. The elevated setose portion of the clypeus* is extended forwards and to a tremendous length (hence the nickname "unicorn ant") and has been warped into a spatulate shape, with pegs restricted to its spoon-like tip and setae running the process' length. Just below the base of the antennal sockets emanate trigger hairs, which are correspondingly longer than in any other haidomyrmecine: indeed, they are more like whiskers than anything else (Perrichot et al., 2016). As the term "trigger" would suggest, it has been imputed that haidomyrmecines were ambush predators with a "trap-jaw" strategy, much like living Anochetus or Myrmoteras; dissimilar to the likes of these, however, the mandibles would have snapped upwards upon triggering, pressing prey items against the spatulate clypeal process, the setae upon which would have provided gripping capability. While the majority of modern ants which conform to a "trap-jaw" habitus are generalist predators, the fact that the armature of Ceratomyrmex would have been useless for capturing prey items below a certain size suggests a considerable degree of dietary specialization (Perrichot et al., 2016). Of course, it is anyone's guess as toward what prey items this remarkable specialization was directed. 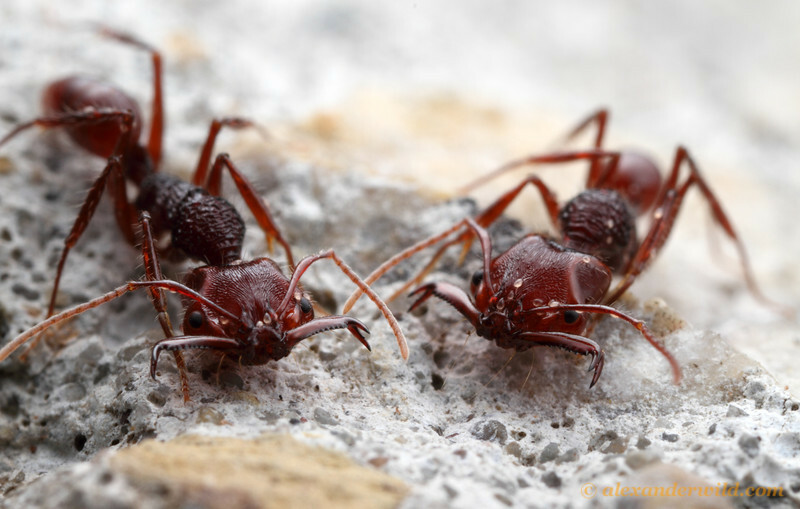 Without a doubt, we can add the "unicorn ant" to the long list of insects that we wish still lived on this planet. *An insect mouthpart articulating with the frons (i.e., face), from which emanates the labrum.